One of the symbols that I have always found fascinating is the crossroads. Not only is it a representation of a point in our lives where we must choose a direction, but it is also an intersection between two realms: the conscious and subconscious, life and death, past and present. Maya Deren’s exploration of voudou offers great insights into the powerful symbolism of the crossroads. Anyway, as I am continuing to read through Cervantes, I have noticed the symbol appearing in the text. In fact, Don Quixote states in no uncertain terms how important the crossroads are. What is being expressed here is that the story of Don Quixote and Sancho Panza conveys more than what appears on the surface. It is not just an island in the vast sea of literature. It is a mystical place where the spiritual and the physical meet, where the veil between reality and the imagination is torn away. Not long after this passage, Don Quixote and Sancho meet a group of shepherds at a crossroads who are on their way to a funeral. They had not gone a quarter of a league when at the meeting of two paths they saw coming towards them some six shepherds dressed in black sheepskins and with their heads crowned with garlands of cypress and bitter oleander, Each of them carried a stout holly staff in his hand and along with them came two men of quality on horseback in handsome travelling dress, with three servants on foot accompanying them. Courteous salutations were exchanged on meeting, and inquiring one of the other which way each party was going, they learned that all were bound for the scene of the burial, so they went on all together. Here we have the intersection between life and death. The three plants that are mentioned—cypress, oleander, and holly—are all evergreens and symbolize the cycles of life, death, and rebirth. I still have a long way to go in this book, and I suspect that Don Quixote and Sancho will find themselves at many other crossroads along their journey. I look forward to seeing which pathways they choose. This is very practical advice for living life in the material world. We are spiritual beings having an earthly experience, and we must work and do certain things to take care of ourselves in this life. But what Lao Tzu is saying here is that we should not let our earthly desires dominate our lives. We all must work, and we all need a certain amount of wealth in order to survive, but the key to happiness and the “Way to Heaven” is to be content with just enough, and not to keep constantly striving for more. When we reach fullness, it is time to stop and rest. When a bird has finished building a nest, it does not keep building other ones. Likewise, when the bird has eaten enough, it stops eating. If it were to continue eating after it was full, it would no longer be able to fly. We can spend our lives chasing after things that mean nothing in the end, but will that bring us happiness? I personally do not think so. I encourage you to pause, rest, and reflect on what is really important in your life. I suspect that it will not be material gains. Heaven lasts long, and Earth abides. That they can live so long? But finds himself safe and secure. That his Self is realised? It’s kind of an oxymoron that self-realization only occurs when you shut off your self-importance and self-obsession. You must lose the ego in order to find your true self. This makes me think of the spiritual principles of charity, compassion, empathy, and service. When you turn away from the cycle of chasing after personal gains and shift your focus to things outside yourself, something happens internally. There is a spiritual kindling and you realize that you are more than just your self; you are part of a larger whole that existed before you were born and will exist after you are gone. And you become aware of a deeper meaning to your existence. I think this is the key to finding meaning and fulfillment in your life. In our crazy lives, it is increasingly difficult to step outside our small world of the self. But doing so is of utmost importance, especially in these turbulent times. 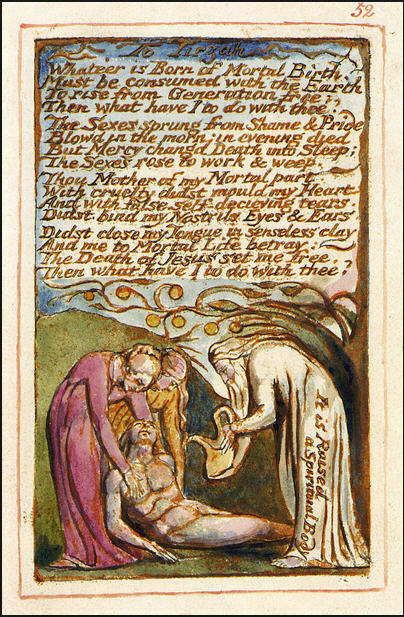 In the image associated with this poem, there are two women holding the body of the young man, who is the speaker in the poem. My impression is that the two women symbolize two aspects of the divine feminine: the mother and the maiden. I sense conflict in the speaker, who may be experiencing maternal love as well as sexual attraction. The mother’s name, Tirzah, is associated with sexual beauty. I’m sure Freudians would agree with this interpretation. But there is also a sense of anger directed towards the mother. The speaker feels he is a spiritual being and through childbirth is now trapped within a physical body, hence bound to the earth and to corporeal existence. At least until he dies. As such, he relates to Christ. When Christ died, his soul was restored to the divine. Hence, when the speaker dies, he also will be “raised a spiritual body” and become one with god. This is certainly a psychologically challenging poem. Does one have to sever parental connections in order to live a spiritual life? How did Christ feel about his mother? Does the Oedipus myth tie into all this? Personally, this poem just stirs questions for me. I’d love to hear your thoughts. Please feel free to post comments below. Thanks, and keep reading challenging texts.